The Portland Water District has the enormous responsibility to bring fresh, clean water to its customers’ homes. However, as a PWD customer, you have some responsibilities as well. Some of the items that are needed to provide you water are actually owned by you! Click on the system components in the image below for definitions and responsibilities. Water Mains: Miles of utility owned water mains carry water from Sebago Lake or the Steep Falls well system to your property. Service Line: These are pipes that go from the water main to your building. The utility owns the portion from the water main to the street line or property line. The customer owns the remaining portion - to and into the building. Curb Stop: The utility owned valve that controls the flow of water to your building. Service Box: A utility owned cylindrical iron box with a cover, at the property line, that provides access to the curb stop. Inside Valve: A customer owned valve that controls the flow of all water coming into the premises. Backflow Preventor: A customer owned mechanism that prevents the backflow of contaminants into the public water supply. 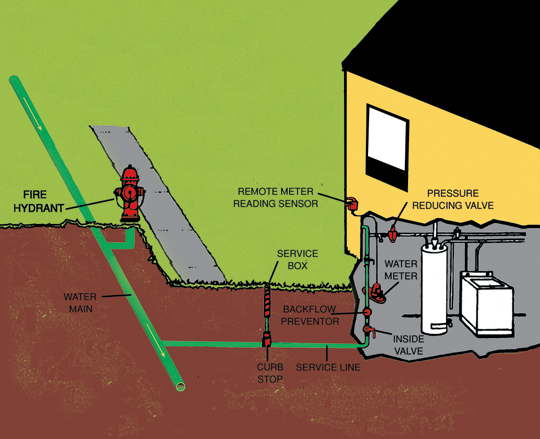 Water Meter: A meter that records how much water you use and is usually located inside the building. Although it is utility owned, the customer is responsible for any damages (freezing, vandalism, external causes, etc.) and may be charged for repairs or replacement. Remote Meter Reading Sensor: Permits meter reading without entering the premises. Utility owned. Fire Hydrant: Provides water for fire fighting. Utility owned.